ITP is a growing but little understood health problem that most people (including some medical professionals) have never heard of. It affects individuals of all ages, sexes, and ethnic origins and ten times as many people as hemophilia. Fortunately, substantial progress in understanding the mechanisms of ITP has been made in recent years. New treatments are now available. As research continues, however, the challenge continues to educate healthcare professionals and the public about this disorder. ITP patients and caregivers often feel they know more about the disease than their healthcare providers. As a result, there has become an increasing need for ITP Centers of Excellence to study, treat, and accurately record data to further understand the disease. Similar centers have proven highly successful for studying, recording, and treating other bleeding disorders like hemophilia and sickle cell disease. While there is no cure for ITP, more is known about the disease each year and new treatments become available. But there are still so many unanswered questions. 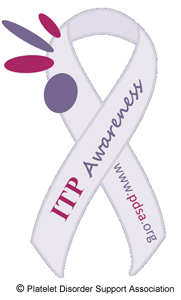 Join PDSA this September as we come together to make ITP as well-known as cancer and heart disease. There's never been a more important time to power up, get pumped, get in the game, and sport purple for platelets! !